Tonight was historic. The in a most selfless and noble act, the resolution below was passed by the Minneapolis School Board. Historic, selfless, noble? Really? Yes, really! First, let me begin by saying tonight caps years of efforts by Minneapolis Swims to convince MPS of the virtues of swimming, and why Phillips, of all places, was the one neighborhood that most deserved a gift from the coffers of the MPS treasury. With MPS firmly entrenched in the philosophy of not investing capital in properties they do not own, and many budget fires of their own to put out, we resigned ourselves to not ever receiving capital dollars from MPS toward this project. Of course, once it is built, we need to make sure it is sustainable, so we were quite pleased to get MPS to agree to a five-year commitment to contribute $150,000 toward operating costs. Over the past year, our fundraising efforts gained momentum and neighborhoods stepped up with significant money, and the real possibility of a Phillips Aquatics Center emerged. The Minneapolis Parks and Recreation Board (MPRB) took notice, other donors took notice, and a swimming task force at MPS was set up, and they took notice. 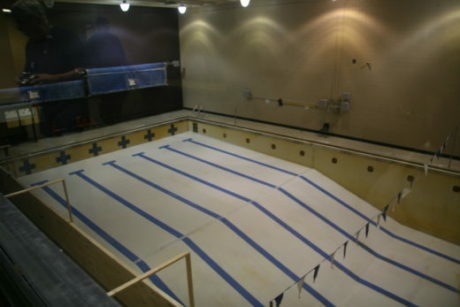 With the MPRB getting close to “picking a final pool,” I had some “what if” conversations with MPS board members along the lines of, “What if you had 50 percent ownership of the Phillips Aquatics Center, and it was going to be a two-pool 8-lane/4-lane facility, where you could use the 8-lane pool to host swim meets? In that instance, would you consider a capital contribution?” In a school district that only has one competition pool (the six-lane pool at Southwest High School), this was interesting to both board members and certain administration at MPS. In the end, it came out looking different, but it got the conversation started. In the meantime, the MPRB passed its resolution, choosing the pool with the 6-lane/4-lane configuration and, although still about $2.4M short, they said, if needed, they would finance the difference. My conversations with MPS continued. Interim Superintendent Goar was portrayed by the Star Tribune, as being opposed to the board on this issue. In reality, he just didn’t yet know enough about the Phillips Aquatics Center. He met with MPRB Superintendent Miller on multiple occasions to get a good understanding of how MPS could best help on the project, and how, overall, the two entities could establish a new level of collaboration on a multitude of different projects and priorities. In the end, these two organizations reaffirmed that they serve the same public and, in many instances, have facilities and services that do or should overlap. By working together, they can both be more efficient and effective and deliver a better product or service. That is how we ended up with a thoughtful MPS resolution that has the word “park” in it many times and results in a selfless gift that puts the needs of the people — who, side by side with the MPRB, they serve together — first. So yes, historic, selfless and noble. What’s next? There’s still the issue of about $500,000 more capital to raise to complete this 6-lane/4-lane facility. We are hoping that everyone who has given, can give just a little more. Additionally, I do have a most exciting prospect that has the ability to step in and, in the Minneapolis spirit of selflessness, write the check we need to bridge the gap to get the competition pool to 8-lanes. I’ll know one way or another by the next issue. Stay tuned! WHEREAS, the Minneapolis Park and Recreation Board is a critical partner in the District’s youth sports, recreation, wellness and engagement efforts and there are many opportunities for greater collaboration in programming, communication, funding and facilities. Establishing City Swims program with multiple partners to promote swimming lessons through pools, parks and lakes. The Board authorizes the Superintendent and Chief Operating Officer to represent the District in those discussions. Commitment to establish joint capital planning, common source scheduling, program integration and shared leadership.